Im not much of a blogger…well I am not one at all I am too busy working. No offence to bloggers intended! I am however working on exciting projects all the time that I don’t capture on there so I thought that I would start a mini portfolio of them here..starting with Table 22. Those of you who know me as Keri Sheehan won’t know that outside of work I am Keri Emmerson and have been since I got married over three years ago. Hubby in question is Greg Emmerson who was lucky enough to fulfil his dream of making it onto Masterchef 2018 this year. Not only did he make it on but he made it all the way through to the Semi Finals coming in 6th place! This in turn has enabled him to fulfil an even bigger dream - opening his own restaurant. With the backing of an investor they are opening Table 22 in Wickham on the 8th December 2018. Its been so exciting and inspiring watching him live his dream and do what he was born to do! For me it has enabled me to fulfil one of my ambitions which is to design a restaurant..well almost. Working with the space that they inherited as part of a beautiful listed building I have been working to completely revamp the old restaurant that was on site. 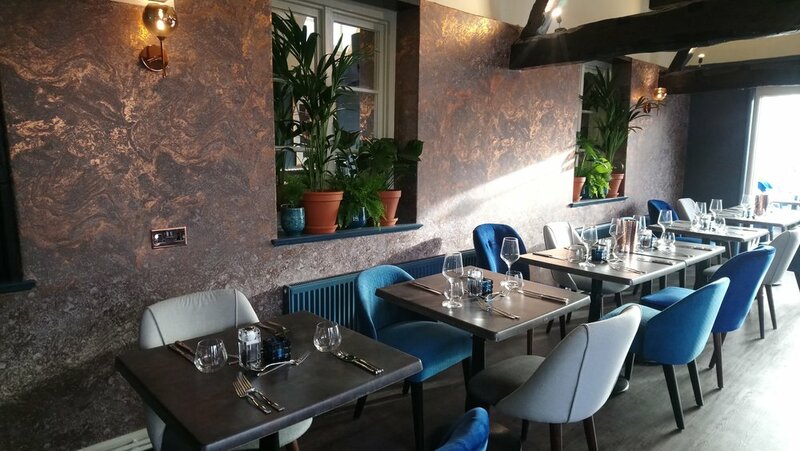 Its not been easy to completely transform it as the structure has to stay in tact, wall finishes, fixtures and fittings are the only thing I have been able to switch up to give it a modern fine dining feel and make better use of the space….Plus I had about 12 weeks to complete it! So what space was I working with.. I needed an idea of what he envisaged for his first restaurant and like any client (even if he is my husband) his ideas and plans for the space were important. My job is to apply the design and concept to his vision to pull it all together and deliver his needs with my design aesthetic. and the investors approval. A few more talks and sign off rounds and we arrived at the mood board below. I was happy with it at the time but looking back I can see the room for improvement that has evolved. Approved moodboard. Now it was sample stage.. we went through a lot of chairs! Picking chairs is an emotive sign off process the ones below are just a few that we put forward. Early morning start heading down with Chef to get the Interior overhaul underway at Table 22! So many beautiful metallic papers to choose from! 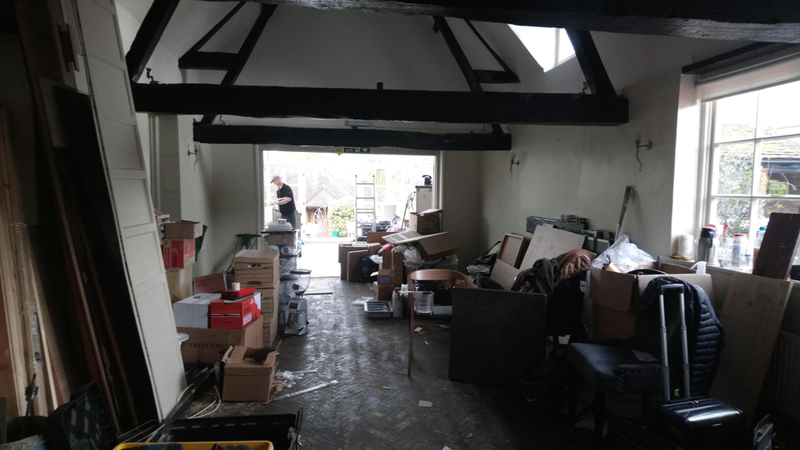 Next day the flooring started to go down…..
Then it was the battle of the lights…old verses new, I needed the chandelier gone to make way for the copper sputniks! Three of these copper delights will replace this old chandelier. Then it all started to happen…. The walls went Blue..very Blue I love it. Big Sis Nikki did some painting for me.. more Blue of course! The old shutters that were once in place here were removed by my brother in law Scott and I could not have been happier about that! In its place I am using a patterned Privacy window film with a lovely mid century design to block off the not so pleasing view of the kitchens cold store. Applying it was easy but after years of installing vinyl and decals in Retailers I might have an upper hand on this one but if they are something you are thinking about you should give them ago. These were made to order and I got it all completed in just under 2 hours. Happy days!! The last fundamental part of the old scheme that I needed to get sign off on removing is now over the line and the blinds are coming down!! These old green conservatory ceiling blinds were not part of my plan ;) it was hit and miss if they would come down but after much discussion and that fact that they had become an insect graveyard (yuk) it was definitely time for them to go. Theses will be replaced with UV and heat reflective window film before spring but for now diners can dine under the starry sky and enjoy the views. I found this in the final clear out…its come a long way in a few weeks! It was a long day but thanks to Nikki and Scott we got the blinds down, cleared up enough bugs to enter “I’m a Celebrity get me out of here” made all the tables and got all the woodwork in the conservatory cleaned and painted! 4 days till the first service!!! 12 hours later and another round trip to London and back and we are back on site, well I was and then I had to do my favourite part of my job…the shopping :) Thanks to a local Hillier Garden Centre I picked up everything I needed to add the final touches to the scheme. Some houseplants and Christmas decorations. Originally I wanted to board over these old mirror nooks and take the wallpaper all the way across. Then due to time and costs we decided to keep them and make them work, the houseplants were a perfect way to make them a feature and to look like a purposeful part of the scheme rather then a left over from the old set up. Christmas Tree done and its only about my 60th tree of the year! What do you think of the picture. 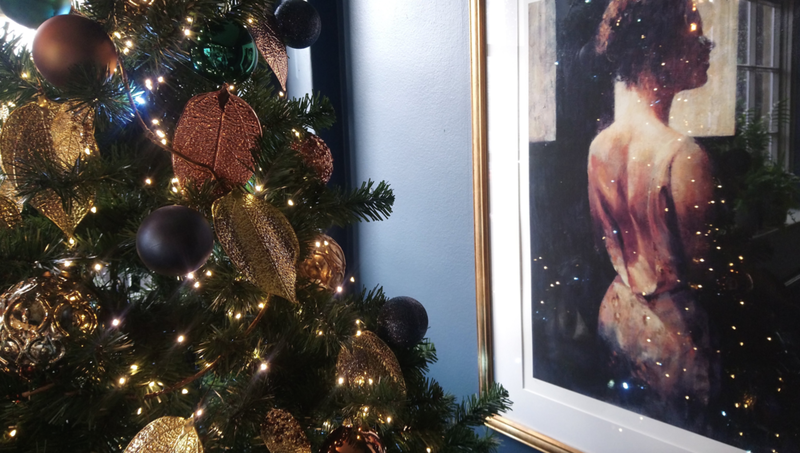 I found these in a cupboard in the old hotel and loved the muted tones and copper highlights in the dress, I thoughT it would be a perfect way to match the old with the new and save some money :) It was one of a pair and the other one sits perfectly over the fireplace. Apart from giving the place a deep clean Table 22 is ready to open its doors :) I am so happy and proud of the finished restaurant and how I have transformed the space. The delayed Banquette seating has arrived and is installed!